Angela Merkel has become the first German chancellor to visit Niger, one of the world’s poorest countries. She has promised money and military vehicles to help the country fight human trafficking and the militant threat. She is on the second leg of a three-country African tour which started in Mali and will finish in Ethiopia. How does Angela Merkel see Africa? She has described it as “the central problem” in the migration issue. Last month, she said the EU needed to establish deals with North African countries, along the lines of its agreement with Turkey, to curb migrant flows across its territory to southeast Europe. What has the German chancellor promised? 77 million euros and ten million in military equipment to combat people-smuggling and illegal migration in the central Agadez region. The long-term goal is to stabilise African countries by creating better economic conditions, thereby tackling one of the root causes of migration. 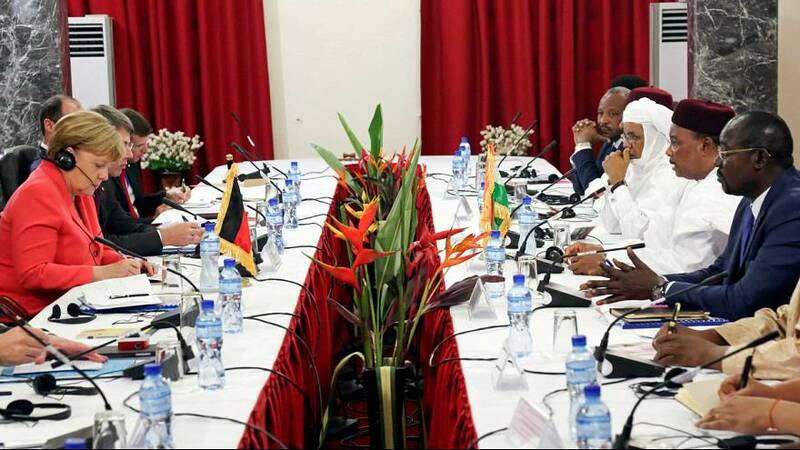 Niger’s President Mahamadou Issoufou welcomed Germany’s assistance. However, he said more money is needed from EU countries to tackle the migration challenge. “We need massively more aid,” he told reporters. An estimated 90% of migrants who reach Libya and head for the EU across the Mediterranean have crossed through Niger. This means the country is a crucial partner for Europe in controlling the flow of migrants. Germany, France and Italy say they want to develop particularly closer relations with Niger and neighbouring Mali. A poll suggests support for Angela Merkel’s conservatives has dipped below the 30 percent mark for the first time. The German Chancellor’s Social Democrat (SPD) coalition partners have gained slightly. It is just over a year before Germany’s federal elections. The INSA survey – published in the German newspaper, Bild – puts Merkel’s conservatives down 0.5% points at 29.5%. The SPD gained 1% but is still far behind on 22%. The anti-immigration Alternative for Germany (AfD) is unchanged on 15%. What is causing the dip? Merkel’s popularity waned after she launched her open-door migrant policy last year. However, it has recovered in the last few months. Merkel is widely expected to stand for a fourth term in September 2017. The AfD has gained ground in regional elections this year. Pollsters say many voters are disillusioned with Merkel’s right-left governing coalition. The SPD’s preferred partner is the Green Party. The poll shows them down 0.5% at 11 percent. The radical Left party, which some in the SPD view as a potential partner, is up by the same amount at 12%.